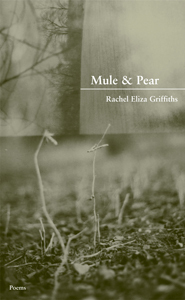 Rachael Eliza Griffiths covers or addresses well-known black women protagonists in her recent volume Mule & Pear. As a result, her work convenes with the works of some major African American novelists. For instance, Griffiths has poems featuring Celie from Alice Walker's The Color Purple, Reba from Toni Morrison's Song of Solomon, and Janie from Zora Neale Hurston's Their Eyes Were Watching God. Her poems also provide quotations from novels by Chimamanda Ngozi Adichie, Gayl Jones, and Edwidge Danticat and from a play by Adrienne Kennedy. Griffiths's dedications and direct, acknowledged incorporation of phrasings illustrates a poet's active engagement with black women creative artists. Griffiths reveals in most of those cases that she was reading closely and well beyond as she offers responses and extensions to the novelists' initial creations. She has several poems that allude to or include direct quotations from Toni Morrison's works. In this regard, Griffiths serves as an important witness to the novelist's narratives and memorable characters. One of her Morrison-related poems "Pecola Breedlove Gives Geraldine a Piece of Her Mind" is dedicated to Elizabeth Alexander and thus creating an even broader direct link to African American women literary artists. Ultimately, Griffiths creates direct links between poetry and novels; she offers visions of a poet absorbing and re-presenting key works in African American literature.